You’re a small business that’s looking to grow or your startup business isn’t doing the extraordinary job you thought it would when you first started. You didn’t think that running a business would be easy, but you thought it would be more successful than how it’s doing so far. You feel like you’re floundering in quicksand in the business world. While running a business isn’t easy, Journey Business Solutions can help you figure out how to grow your business effectively. We can make this difficult journey a little less difficult but providing merchant services that are not only effective, but will help you lead to success and, in turn, to grow. We are a small business just like you, so we understand what you need and how long that endless list of to-dos can end up becoming. We’ll help you get organized, procure top technology for merchant services, and provide access to services that are geared toward making this journey easier for you. You don’t have to go down the path of business alone. With our services, you can excel and have the support you need to grow successfully. When you own a business, you know what it takes to run one. You have the knowledge on what goes on behind the scenes. You’ve probably had a few bumps going down this journey and you know it takes time, energy, money, and experience. Journey Business Solutions understands and recognizes this. We’re a good choice because our business is similar to yours. We are a small business that was started by someone with an idea to help businesses who need some guidance. While your focus is on success, it’s imperative that you also build upon the knowledge you already have, and that can be done by working with a dependable and expert business. Our vision is to help businesses who need some guidance in how to grow. We strive to be a one-stop-shop for all small business owners’ needs. We know that you’re not a large business and thus, you don’t have the resources. However, with our experience and knowledge, we’ll help you reach new heights in acquiring those resources. We have a solution for almost every type of situation that pops up and if we can’t answer, then we have multiple partners we can bring in to ensure your business grows successfully. From selling the right product to delivering an efficient service, Journey Business Solutions is the right choice for you. Our business will give you access to a variety of merchant services. Journey Business Solution deals with payroll and merchant services. Specifically, in today’s blog, we’ll be covering the merchant services you can expect when you come to Journey Business Solutions. However, you can also browse some of our other services to see if we’re the right fit for you. Since we have so many services and products, we wanted to lay out what exactly you can expect from our business. Below, you’ll find a few services you can take advantage of for your startup or small business. 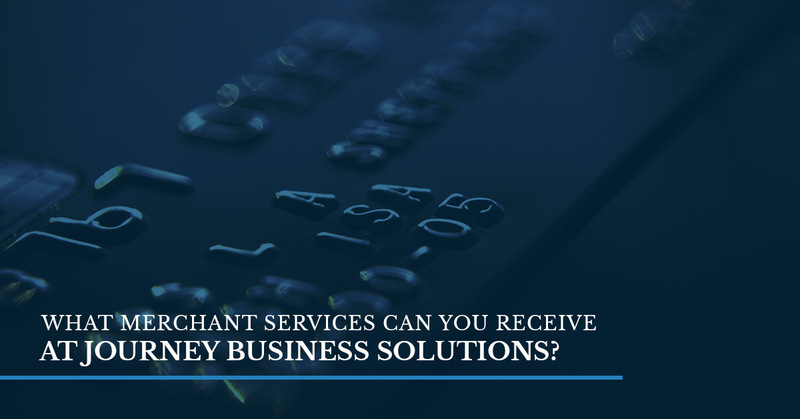 If you have any questions about our services or why it’s essential for a business to have merchant services, then take the time to reach out to Journey Business Solutions. We cater to the Dallas, Fort Worth, and Rio Grande Valley regions. Credit card acceptance is so important to have in your business. Every business should take advantage of this modern technology for credit cards. Giving your customers access to pay via a credit card is so important because so many people use cards to pay. You could lose out on thousands and thousands of dollars if you don’t accept credit card payments. We provide a variety of credit card acceptance products. If you have specific monetary goals in mind, then credit card acceptance is how you’re going to get to that aspiration. No matter what size your business is, credit card acceptance will move you a long way and allow you to grow to your full potential. Loans & Lines of Credit Service is one of the merchant services we offer that’s great to help you reach your long-term goals. You have a big picture for your business, and with loan and line of credit solutions, you’ll be covered to help your business expand. This service provides fast financing via a trustworthy business. Journey Business Solutions is dedicated to helping you grow, which is why we offer this superior service. You can capitalize on your goals by partnering with Journey Business Solutions and getting the funding you need instead of going through a bank. We know how hard you work and we feel that you deserve a little leeway where cash flow is concerned while you work toward your dreams. Total merchant services are the whole package. All you need to do is figure out what product is right for your business. We provide total merchant services to make your journey in business easier. In addition, we want to make sure that your payment options are secure. By providing access to secure payment solutions, your customers will be protected. With so many breaches in technology, it’s important that your customers know you have secure forms of payment. Furthermore, total merchant service will allow you to be able to use any form of payment. This will encourage more customers to come to you. Lastly, we have products from Pay Pro Tec. Pay Pro Tec comes out with the most progressively created technology that will meet your needs. We are proud to offer these products since they allow our customers to stay ahead of the credit card industry. These cutting edge forms of technology are geared toward helping you address specific needs for your business. By providing easy-to-use and secure products, you can help your business grow. For more information about our merchant services, stay tuned for the next blog.